Bumps and Bashes Baby first aid courses – for parents of babies & children. 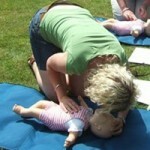 I teach Children & Baby first aid specifically for parents, grandparents and carers. I can come to your home or venue & you can have your very own Private First Aid Course. Learn these vital skill with your own family, friends or group of parents. If you are fortunate to live in Greater Manchester, Cheshire, Lancashire & Merseyside area, you’re in luck. Through the kindness of past attendees & their lovely reviews & recommendations, these are very popular. Why wait! If you would like to know when Bumps and Bashes first aid courses will be taking place near you, or if you would like an informal chat about a private home first aid classes or any other matter, I’m happy to chat. When enquiring about a private home course, please let me know when you would like to hold this weekday/weekend morning, afternoon, or evening. I do get incredibly busy, with many courses booked weeks even months in advance, so as much information would be appreciated, to let you know quickly what available dates are free.